When evaluating a company and its stock, I review the company's balance sheet. A beautiful balance sheet attracts me to a company and its management and an ugly one repels me. 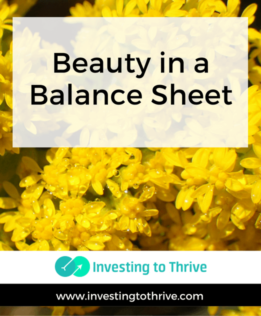 Let's delve into how this essential financial statement can hold beauty. If you'd like to look at a balance sheet, you need to know where to find this gem. Depending on your broker's interface design, the balance sheet may be listed under Fundamentals or Financial Statements. Key measures I consider when analyzing a balance sheet are cash position and debt. Beauty to me is plenty of cash, enough to cover outstanding debt. I figure that if the going gets tough, a cash-strong company will be able to handle difficult periods without taking desperate (and stupid) actions. It may also have the capacity to withstand competitive attacks and develop a stronger offensive that provides impetus for further growth. At first, I look at cash and short-term investments as well as both short-term and long-term obligations. Short-term obligations include accounts payable and other current liabilities. Accounts payable are like bills in hand, similar to the ones that come due monthly at my house along with charges for one-off purchases I make. I like to have cash available to pay bills due soon — and I love businesses that do the same. Next, I consider long-term debt. Debt isn't always terrible and long-term debt obtained at low interest rates could allow a company to expand at a relatively low cost. Debt can mean that a company has learned to borrow well but not necessarily generate profits effectively. It could also portend problems if interest rates spike. So, I like to see that a company has enough cash to readily pay down debt, if such action is needed. I love to see that the company is managing its balance sheet in a way that maximizes profit potential with plenty of cash and responsible use of debt. Cash and debt are huge for me as I think those two reflect the company's ability to generate cash and manage its finances. But there are also other aspects of the balance sheet that I notice. One of these items is inventory. Generally, for a retailer, inventory represents products for sale at brick-and-mortar stores or items held in a distribution center awaiting shipment to customers. For a manufacturer, inventory may include finished products ready to ship or parts and components planned for production. A great company will know how to manage its inventory in a way that satisfies customer demand but doesn't tie too up much money or facility space in unnecessary products. I don't expect a company to be perfect in managing its inventory, especially in times of rapid change or growth periods. However, I don't like to see huge build-ups of inventory compared to sales. If sales increase, then some inventory increases may occur. But if sales decrease and inventory increases, then I sense problems ahead. In this type of situation, a company may have bought too much stuff that it will never sell or will be forced to sell at a discount. When products become too heavily discounted, then gross margins start to erode (gross margins can be determined by looking at the income statement). When margins get noticeably smaller, then the company is showing that it's losing its competitive position. Such a company could survive but becomes less valuable to me as an investor. Some companies may try to disguise inventory increases and its effects. For example, a company may record anticipated sales, not actual sales, potentially reducing inventory and possibly increasing accounts receivable. These entries of “sales” are simply (and wrongly) hoped for and never materialize. (Note: falsely reporting sales is considered wrong by the SEC; see this case as an example). In other cases, a company may loosen its credit practices in order to sell more. This approach can backfire if less credit-worthy buyers aren't able to pay. So, as a general guide, looking at accounts receivable balances over time can tell me if sales are happening because of strong demand, which is good and bodes well for the company's future; or if they're being pushed with the hope of selling down inventory, which isn't good and convinces me to stay away from a company as an investment. To be clear, the balance sheet is not the first financial statement I review. First, I check the income statement, where I like to see that the sales and operations are healthy, with nice gross margins and controlled expenses. Then, I consider whether the company is generating a generous amount of cash on a regular basis by reviewing the cash flow statement. After these financials satisfy me, I turn to the balance sheet. Strong sales, gross margins, and cash flow tell me that the company is exciting. A beautiful balance sheet reveals that behind this thrill are strong finance people who not only support the company's operations but also assure that money is managed effectively. What do look you for in a balance sheet?